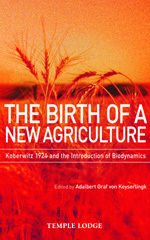 In addition to the lively and entertaining accounts of the agriculture course held at Koberwitz, this extraordinary book features Countess Keyserlingk's memories of her meetings with Rudolf Steiner. Steiner told the Countess that she had a consciousness which would be usual 'in the third millennium', and her reminiscences reflect this uncommon quality! Also included are essays by the editor which incorporate rare material such as the communications received by Countess Keyserlingk after Steiner's death. This book will be of interest to students of biodynamics as well as those interested in how Rudolf Steiner worked to develop anthroposophy. It is compiled and edited by Adalbert Graf von Keyserlingk, the son of the Count and Countess who hosted the Koberwitz conference.